FarmgirlCyn: TO MARKET, TO MARKET! Farmers markets abound beginning this next week, and though I have one of those funny looking metal granny carts that I trail behind me, I still need something to put my goodies in! In the past I have used the Trader Joe's bags, which are so much fun...but after 2 solid years of use, they are beginning to look a bit dowdy. 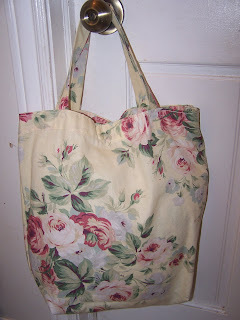 So last week, while blog browsing, I came across a really simple pattern for a handmade market bag! Now, anyone that knows me, knows that I can pretty much sew a straight line, but when it comes to following patterns, let's just say I'm a bit on the slow side. I have to read them, re-read them, read them again...call a friend, do a trial run, tear out the trial with my most-used sewing item...the seam ripper... cry...then try again. I am self taught, so I can't blame my lack of skills on my teacher! So by trial and error (mostly error) I have made several skirts, some aprons, a small purse, and now this! this is really so simple a child could do it. And I even messed around with the measurements, as I wanted mine a bit bigger than the pattern called for. I made one a few days ago, and with many interruptions, it took me a couple of hours. This one with no interruptions, just a bit over an hour. I used some 10 year old K-Mart Martha Stewart broadcloth curtains for my material, but any type of canvas or broadcloth would do nicely. Sorry Melissa....sometimes our dog Beau is not the only doofus in the house! I believe you should trademark "easy peasy"
I'm so proud of you for your persistance! YAY FOR CYN! I love the bag, and I know you'll probably be making more, right!? Oh thanks for posting this... I am going to check out the pattern because I just love your!!! Ahhhhh... finally home from work... First thing I did was open the windows...got the fresh spring air coming in! Relaxing and enjoying your post today :) I'm making it a point this year to support our local farmers more than usual... A great bag will be an even bigger incentive to go! I LOVE it that you used old curtains... I am always finding new uses for "old stuff" ... it makes me feel good when I say... "see... it was good that we saved that! haha! SUPER!!! I've just begun sewing in the last year. I've made quite a few things---and spent a lot of time with my new friend, Ms. Seamripper. GREAT JOB! Love the fabric! Adorable!! I need to make some market bags. I use a real mixture of bags from everywhere....a rainbow of shabbiness (not in a good shabby way) and I could use some pretty ones!! Nice pattern and lovely bag; thanks for the pattern link. This is my first visit to your blog- I'm really enjoying it! Thanks for including the pattern link. This looks like a great project!